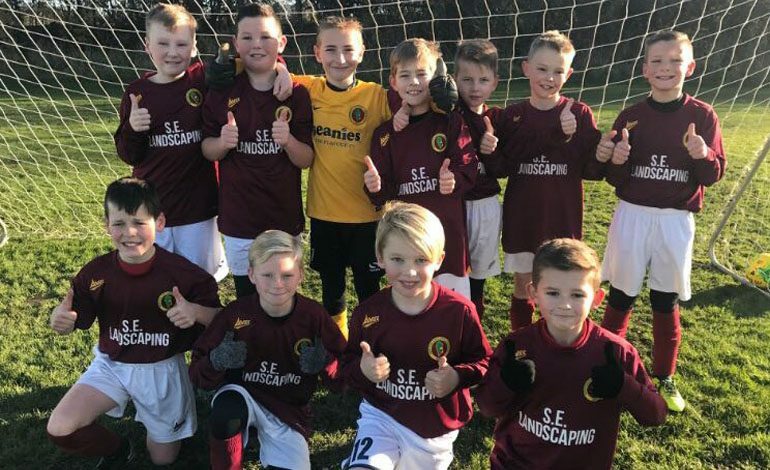 It was another weekend of great footballing action for the Aycliffe Juniors. Some fine performances led to positive results whilst others will be looking for improvement next week. The Under 6’s enjoyed a friendly against neighbours Shildon. There were plenty of goals and a win for the Aycliffe team. Over the three mini games played there were goals for Denver, Jack, Dom, Daniel, Marley and Kai. The Under 7’s visited Darlington to play Spraire Lads but couldn’t quite get the win. The score was 3-0 at half time but in the second half Aycliffe created more chances and scored a good goal through Evan after brilliant work by David. The game ended with the score at 4-1 as despite a great effort there were no further goals for the Aycliffe team. The Under 8’s hosted Stranton FC and found themselves 3-0 down after ten minutes. Thomas’ hatrick brought the half time score to 4-3 after the visitors also added one more goal. In the second half goals from Oliver, Dylan (2) and another from man of the match Thomas saw the game end with a 7-5 win for Aycliffe. The Under 9’s played away at Leven AFC but couldn’t beat a strong team and lost the game 4-2. Jayden did score first for Aycliffe before Leven piled on the pressure and took the lead. Kai scored in the second half and Josh T was the man of the match. The Under 10’s ‘Black’ made the short trip to Darlington to play Young Bulls they scored first when Jake finished well. The Darlington team though scored two second half goals to win 2-1. Goal keeper Jack was named as man of the match. The Under 10’s ‘White’ were at home playing against Golden Flatts. They secured a 3-0 with Jayden (2) and Niall scoring the goals. Jack was named as man of the match. The Under 11’s played Kader FC at Sunnydale after a goal less first half their efforts were rewarded with two second half goals. Zak got the first with a lovely strike then after Charlie P hit the bar it was Thomas who added the second. Kader were kept out with man of the match Mackenzie excellent in defence so the game ended with a 2-0 win. The Under 12’s Russell Foster League team were playing away at Jarrow FC Phythons. They conceded goals early in each half then Ashley’s superb strike made it 2-1. In a close game it was Jarrow who went in to add two late goals and seal a 4-1 win. Taylor was captain for the day and named as man of the match. The Under 13’s had a local derby playing at home against top of the table Ferryhill Wanderers. It didn’t turn out to be a great day for them as they fell to a 9-0 defeat. The Under 16’s travelled to face Northallerton Juniors but lost out 6-0 in a game they ended with ten men after a sending off. The Under 23’s visited Bishop Auckland knowing a win would see them go above their hosts in the league table. Things didn’t go there way and they slipped to a 9-3 defeat.